Fifth and Sixth Graders were introduced to our new online daily newspaper this week. 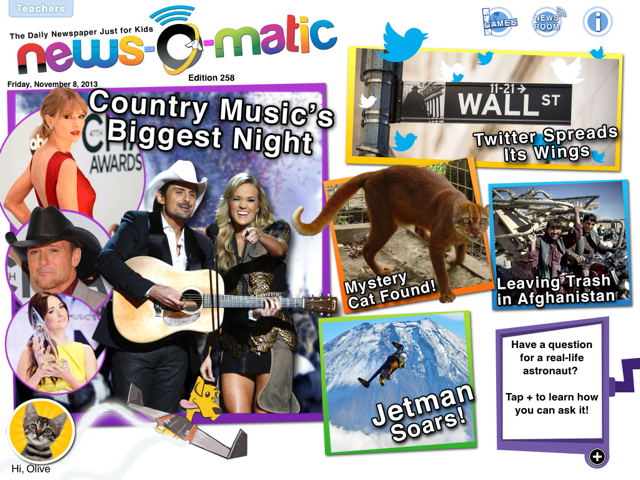 News-o-Matic is a free app for the iPad and we have a yearly subscription to the actual newspaper. Everyday, the content changes and it is filled with interesting stories and great information and videos. There are games to be played using the content as well. In addition, teachers can receive a daily lesson plan with activities that are aligned to Common Core Standards. This is a great product! And best of all….the students loved it! I have put it on our two iPad minis and students love “reading the paper” during their silent reading time. Kindergarten–A perfect match for our Visible Thinking Routine called Every Picture Tells a Story, My Snake Blake by Randy Siegel, gave students lots of chances to figure out what was happening by looking carefully at the pictures. Even the shape of the book gave them some clues before they looked at the cover! 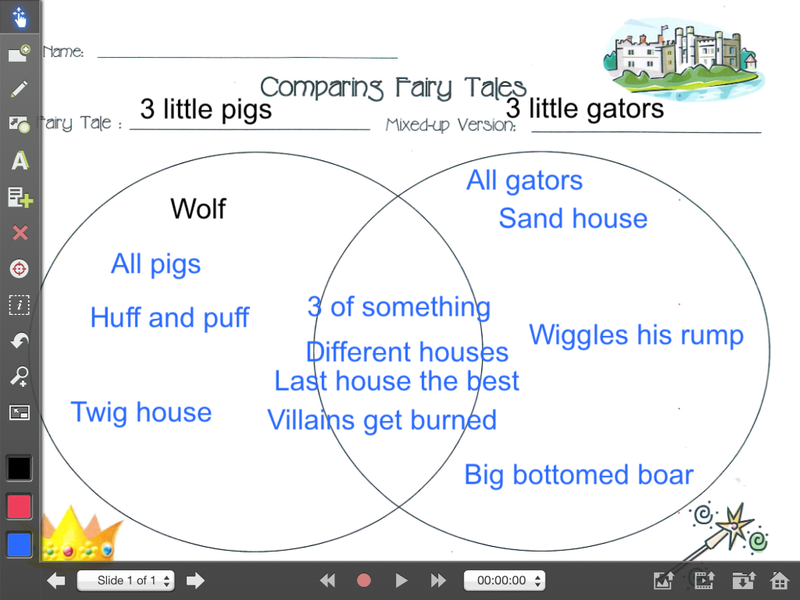 First Grade–First graders worked on making inferences with a fun new book app called Nora and the Noisy Neighbours. Nora keeps hearing noises from her neighbors and tries to figure out them out. Students made guesses along with Nora using their knowledge and then compared them what was actually making the noises. This is a very simple app and perfect for teaching inferences to first graders. Third Grade–Third graders used their Visible Thinking skills to look at a slide from the book, think about what is happening, and wonder about what could come next. The book, Jack and the Baked Beanstalk written and illustrated by Colin Stimpson, is a fantastic read aloud book–wonderful illustrations and a great variation on the Jack and the Beanstalk story and it was fun to compare and contrast the two. Fourth Grade–Fourth graders first looked at a slide from Randy Riley’s Big Hit by Chris VanDusen. They speculated about what was going on in the picture by observing the details and making suggestions about what could happen in the story. This is a great read aloud with wonderful Mid-Century Modern style illustrations and a nice message about using your thinking skills to solve a problem. Fifth and Sixth Grades–see opening post.